Europe Continuous Glucose Monitoring Systems Market was valued at $58 million in 2015, and is expected to reach $792 million by 2022, supported by a CAGR of 44.9% during the forecast period 2014 - 2022. The Europe continuous glucose monitoring systems market is the second largest market of the global continuous glucose monitoring systems market. Continuous glucose monitoring systems (CGMS) are used to constantly monitor glucose levels in diabetic patients, thereby helping in reducing the risk of developing long-term diabetic complications by stabilizing the elevated glucose levels. The Europe continuous glucose monitoring systems market is expected to witness significant growth from 2016 to 2022, owing to numerous advantages of CGMS such as minimal invasiveness and real-time blood glucose monitoring. In addition, increase in per capita healthcare expenditure, increase in incidence of diabetes in Europe, and growth in purchasing power due to high disposable income of individuals are expected to fuel the EU CGMS market growth. Furthermore, the ability of CGMS to provide detailed analysis of blood glucose levels and higher precision as compared to traditional blood glucose monitoring supplements this growth. However, high costs associated with CGMS, lack of adequate reimbursement policies, and stringent government regulations restrict the global continuous glucose monitoring systems market as well as Europe continuous glucose monitoring systems market. 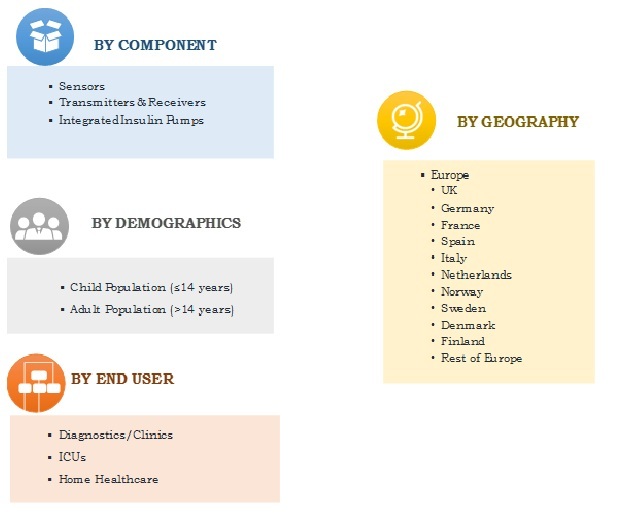 The EU CGMS market report analyzes the market based on four segments: components, demographics, end users, and country. Based on component, it is categorized into sensors, transmitters & receivers, and integrated insulin pumps. Based on demographics, it is bifurcated into adult and child population. Based on end users, it is mainly classified into diagnostics/clinics, ICUs, and home healthcare. Based on country, the EU CGMS market is analyzed across Germany, France, UK, Spain, Italy, Netherlands, Norway, Sweden, Denmark, Finland, and rest of Europe. The Europe continuous glucose monitoring systems market value is growing at a significant pace owing to the rise in diabetic population and increase in adoption rate of CGM devices. Key players focus on new product development to meet the specific requirements of the researchers. For instance, in May 2016, Senseonics Holdings Inc. received CE mark approval for Eversense CGM system that includes implantable glucose sensor, a wearable transmitter, and a mobile app. Agreement and partnership are other key strategies adopted by the key players. These strategies between different companies, healthcare facilities, and academic institutions can positively impact the market growth. For instance, in May 2016, Senseonics signed a distributive agreement with Roche to market and sell Eversense CGM system in Germany, the Netherlands, and Italy. Key players profiled in this report include Abbott Laboratories, DexCom Inc., Echo Therapeutics Inc., Insulet Corporation, Johnson & Johnson, Medtronic plc, Senseonics Holding Inc., and F. Hoffmann-La Roche Ltd. Other players operating in this market include AgaMatrix, Inc., GlySure, OrSense, and Ypsomed. The Finland continuous glucose monitoring systems market is projected to grow at a CAGR of 43.9% during the forecast period. This is due to rise in incidence rate of diabetes. As per statistics of IDF Atlas 7th edition, Finland witnessed the highest number of new cases of type 1 diabetes. This Europe continuous glucose monitoring systems market report provides an extensive analysis of the current EU CGMS market trends and future estimations. The market scenario is comprehensively analyzed with respect to the components, demographics, and end users. Market estimations are based on high-end analysis of the key developments from 2014 to 2022. 8.4. F. HOFFMANN-LA ROCHE LTD. The European continuous glucose monitoring systems market consists of systems that manage diabetes by providing real-time glucose levels and alert the patients in case of hypo- or hyperglycemia. This helps reduce the probability of any complications related to diabetes. Geriatric patients tend to skip or forget their hypoglycemic medications; in such cases, CGMS devices automatically deliver the insulin dosage. Owing to these reasons, geriatric patients are more amenable to integrated CGMS devices that help maintain tight glycemic control (TGC) and auto-deliver insulin as per the circadian clock. Growth in demand for advanced CGMS devices has revolutionized this technology. For instance, smartphone-connected CGMS are devices that connect with a smartphone’s built-in activity monitor, GPS, scheduling systems, contacts, camera, and voice activation, and sub-sequentially display results and trend analyses. Non-invasive CGMs such as Symphony CGM System have gained importance owing to their user-friendliness, widespread applications, and FDA approvals for these products. Bionic pancreas, a smart and a complete diabetes management solution majorly for Type I diabetes patients aged 14 years and older, was the ultimate objective in terms of technological evolution of the CGMS, which is achieved by Medtronic plc. On September 2016, Medtronic received FDA approval for its MiniMed 670G hybrid closed loop system, an artificial pancreas, which is yet to be approved for use in European countries. "Europe Continuous Glucose Monitoring Systems Market"